Daig O’Connell spent many of his childhood weekends and summers building things with his brothers. From model cars and trains to helping their Dad with construction projects, building was always a part of what he and his siblings did. But when it came to choosing a career path, it was mechanical, not structural, engineering that caught his attention. Daig earned his B.S. in Mechanical Engineering from the University of California (UC) at Berkeley, and spent two years studying Architecture at Harvard University’s Graduate School of Design. In addition to his work at Cammisa + Wipf, Daig’s career includes designing geothermal plants, working for another design firm, and founding and managing his own business. He’s found that he thrives in an environment where he has the opportunity to see the big picture and to provide solutions that meet the needs of the many stakeholders involved. So when Cammisa + Wipf asked him to help build their mechanical engineering group, it was an easy decision. Daig has designed almost every kind of mechanical system that can go into a building. 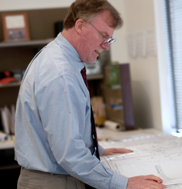 He particularly enjoys creating solutions to complex problems – overcoming challenging spatial issues for equipment, for example, or finding a way to replace critical systems without affecting ongoing services. Daig attributes Cammisa + Wipf’s success to three essential things: providing contractors with very clear and detailed construction documents; designing high quality, efficient systems; and having the experience and expertise to handle large, complex projects.